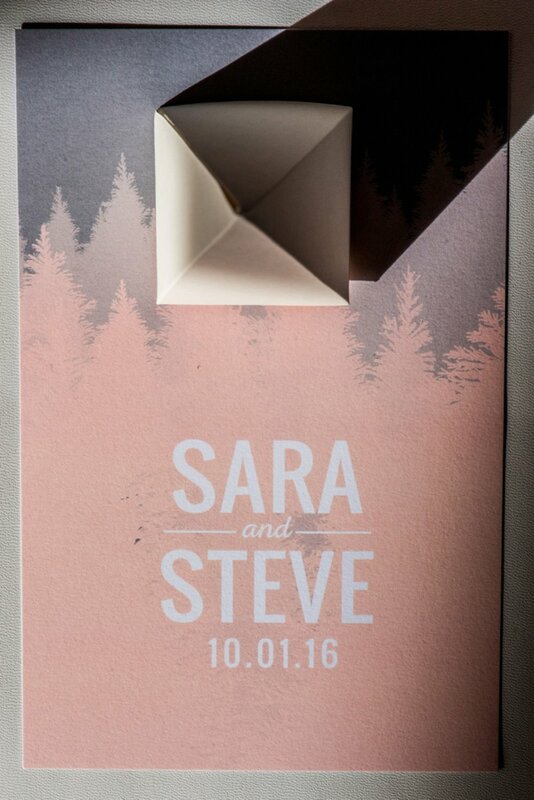 Sara & Steve had a gorgeous wedding but for those who weren't there, a small detail might be overlooked: the first workout in lieu of a first dance! 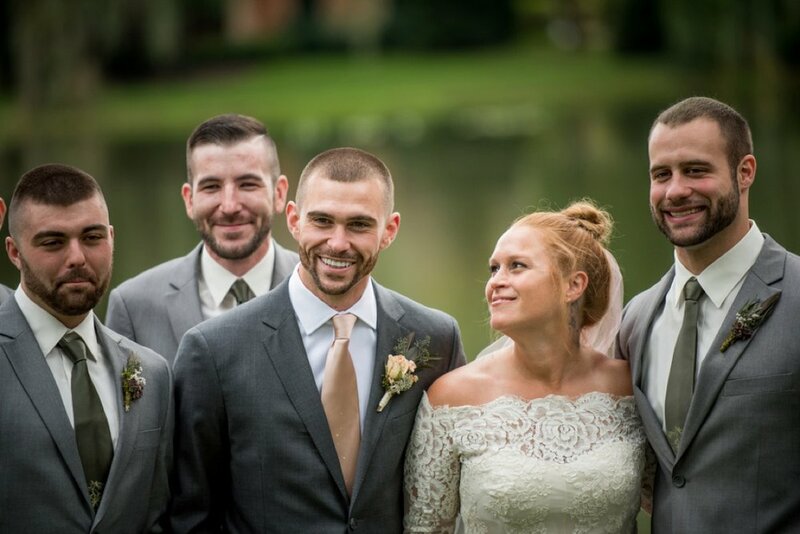 I absolutely love that this couple took a tradition that might otherwise be uncomfortable for them and put a spin on it so it was unique to them and most important, fun! 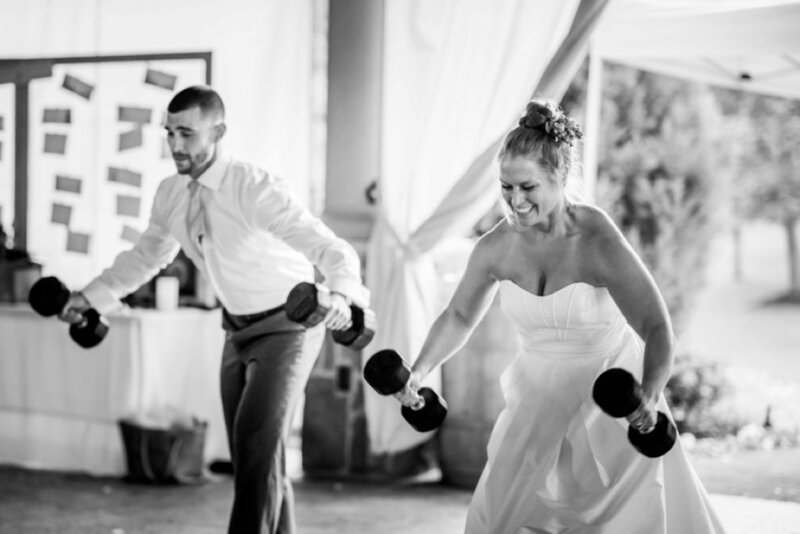 Sarah, the fit bride shows off her sculpted shoulders doing a bent over reverse fly with what appears to be some pretty heavy weights! Read Sarah's take on fitness and the reason why her and Steve keep fitness a priority in their lives and their relationship below. How did you two meet? Did it have anything to do with fitness? We were at dinner the first weekend in May. This was a couple years after we first met. It was beautiful out so we decided to walk around outside. We stopped on this bridge that crosses into downtown just to take in the scenery and the lights - i was busy loving the moment and when i turned around he was down on one knee. What kind of sport/fitness activity do you two do together? We have two Great Danes so we love to take them hiking in the woods, simple walks in the neighborhood and to dog parks/beaches. We also like to do those obstacle runs like the Warrior Dash / Tough Mudder and ride our bikes to dinner in the summer. Do you have an athletic background? What sport did you play? Yeah, we have pretty much been active our whole lives - I played Soccer, Basketball and Fast Pitch all through high school and then Lacrosse in college. Steve played Baseball in high school and Rugby in college. Once our school days were over, I played many years in a local co-ed Flag Football league and Steve continued Rugby for a while until work and other interests took priority. Now we are just gym rats and try to be outdoors as much as possible. What prompted your interest in this sport or activity? My whole family is pretty athletic and Steve's is the same. My parents were big on allowing me to try it all - from when I was little they said they never knew what I would like or would be potentially good at; might as well try it all, so that's what I did. We had everything from hockey sticks and tennis rackets to golf balls and boxing gloves. How have you managed to make (and keep it) a priority in your relationship? What's been your aim with this activity -- to get stronger, lose weight, stress reliever or something else? I dont think I have ever had one set goal for what I'm doing - it has always been all of the above: to get stronger, lose weight stress reliever, etc. Luckily i have found that if you work hard and put in the work it really does take care of all those things and more. How has this sport/fitness changed your body? Are you happy with those changes? I have always been thicker/have more mass. But i do feel that my sports choices have changed my body for the better. My body was built for the slide tackles in soccer, the quickness in basketball, the stealing bases and all out dives in fast pitch. I knew my body could take the beating and show up the next day ready to do it all over again. It has done all that and more - I couldnt be happier with the 34 years its given me so far - excited to keep it going. 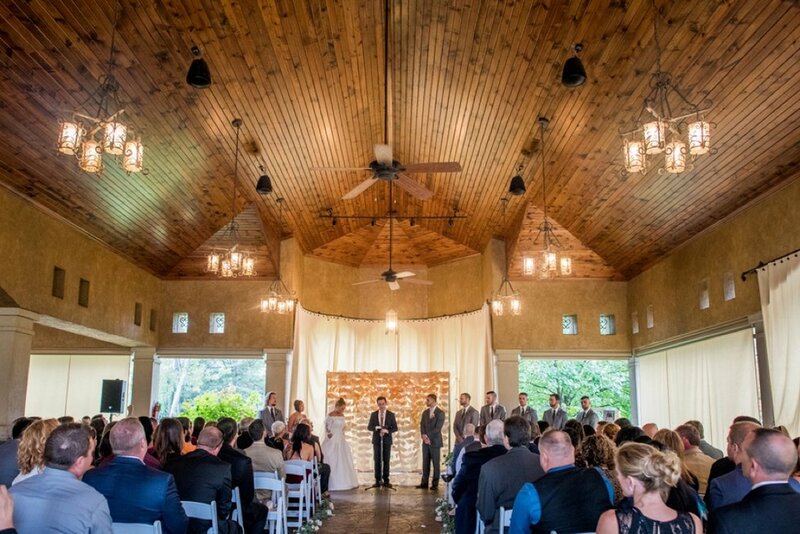 What a phenomenal idea of having a first workout in lieu of a first dance! Steve HATES to dance and i could tell he was kinda stressing about possibly doing a dance with all eyes on him/us. So we sat down and figured out what really was us, asking ourselves, "What do we love to do and what makes us happy?" And with that, our first workout was born. How did you come up with the workout? 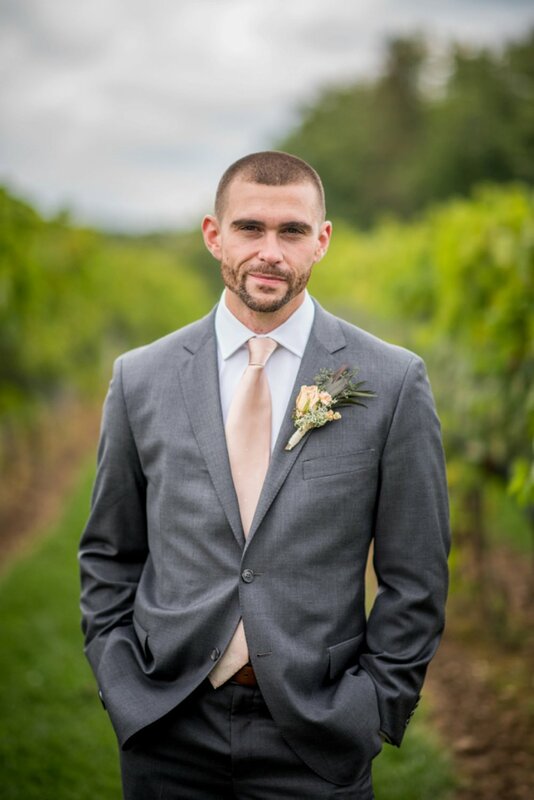 We had to pick moves that I could do in a dress, Steve could do in a suit and didnt require us laying on the ground because our venue was indoor/outdoor. This was probably the best part because we would spend a little time each night coming up with moves, the flow of the moves,what props we were gonna use, the music - and a ton of laughing while doing all that. What did your friends, family and guests think of it? They LOVED it! Only a handful knew, so it was extra exciting hearing everyone get pumped once they saw the weights come out and i change from my heels to my Nike's. Was it a surprise to them? 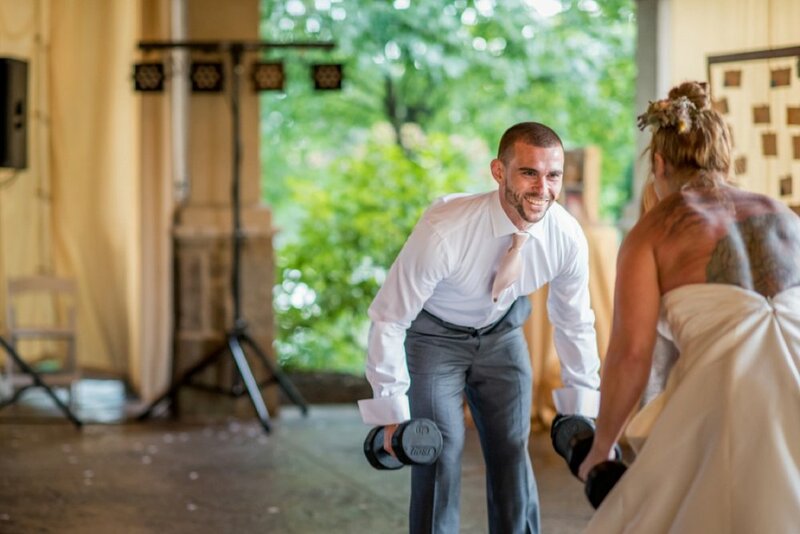 Did you incorporate fitness into your wedding in any other ways? No, other than it being at a pavilion - for that rustic outdoor feel and our engagement pics done in the woods with our dogs. The actual wedding was just more things that were all about us. Books as centerpieces, our Great Danes pictures blown up as fat heads for people to take pics with, donuts instead of a cake, etc. Honestly, all the little details and personalizations were my favorite part. Ha! Ummm, something that I am pretty proud of was a personal bucket list item I had been working on for a year before we met. I completed it about 3 months after that with a 2nd place trophy in a local BodyBuilding Competition - heavyweight. It was grueling and I'm happy I did it, but it is now crossed off the list and probably won't go back on anytime soon. What's your favorite type of workout/move/exercise? I've gotten really into tempo runs - where i will run at like a 7.0 pace for 1/2 mile and then walk for 2 minutes - Ill repeat that 10 - 15 times in a row trying to increase that 7.0 but never below a 6.0. Other than that, i gotta say a bicep curl or an Arnold press are some of my classic favorites. 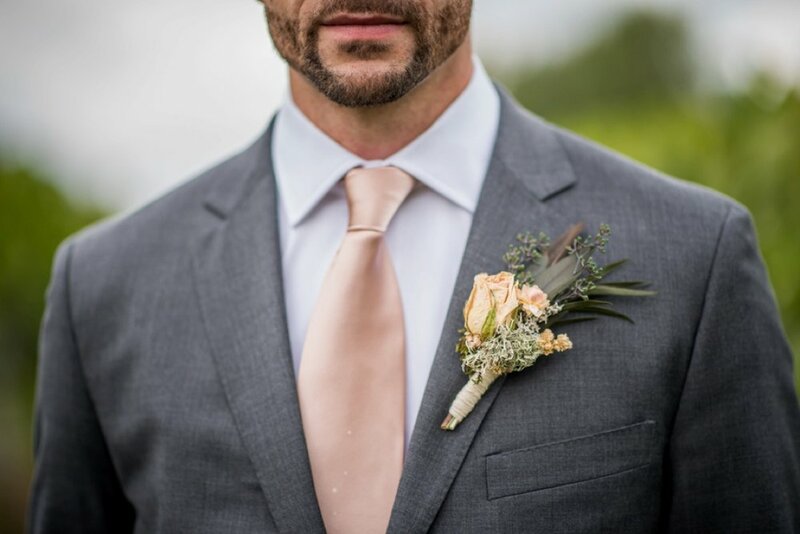 Did you follow a specific diet leading up to your wedding? I didnt really. I had come off my super strict body building diet and was being a brat! Ha! I will say though, that my go to snack was popcorn - PLAIN, no salt no butter no nothing. Sounds boring and gross, but it did the trick. Do you have any long-term fitness goals? I do, I know I have never and will never be 120 pounds (shoot, I'll never be 140), but I've learned that it is just a number.I concentrate on how I feel, how my body handles certain workouts and i just try to keep pushing. My goal is to keep my body guessing and have fun - and to just keep moving. Where do you see you and your hubby in 10 years from now? Imagery Provided by Three & Eight Photography via Two Bright Lights.